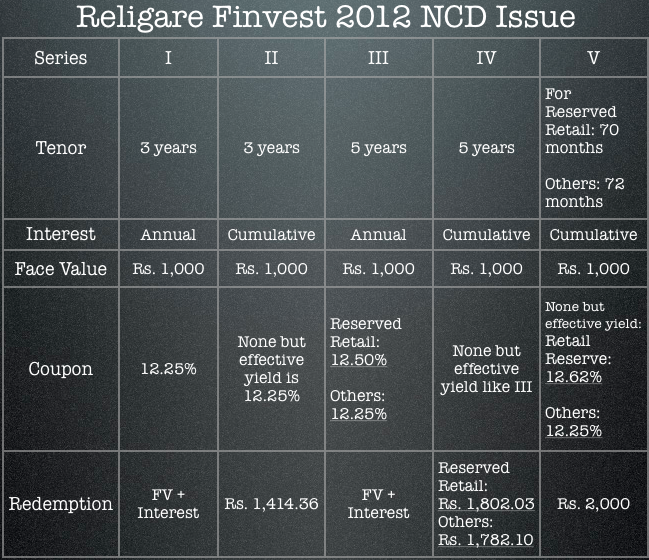 Religare Finvest which is a fully owned subsidiary of Religare is also coming out with a NCD issue shortly, and this is about the same time when they issued NCDs last year. I’m going to talk about some key points that people looking to invest in NCDs are looking for and then move on to some general aspects. Issue Open and Close Date: The NCD open date is on September 14 2012 and the close date is on September 27 2012. Issue Available to NRIs: NRIs can invest in these NCDs on a non – repatriable basis. Non Reserved Individual Investors: Individual investors who invest more than Rs. 5 lakhs. Reserved Individual Investors: Individual investors who invest less than Rs. 5 lakhs. Here is a chart that shows the terms and conditions of the 5 series. Interest Payment and Record Date: Interest will be paid on 1st April every year wherever applicable, and the record date is going to be 10 days prior to the interest payment date. Secured or Unsecured: This is a secured issue; this doesn’t however mean that your money is guaranteed by anyone and if you’re unsure of what this means then please leave a comment. Credit Rating: The issue has been rated “CARE AA-” by CARE and “ICRA AA-” by ICRA. Both of these are good ratings. These yields are certainly better than the Shriram City Union NCD that came out before this one, and at over 12% for all maturities I think this is pretty decent. Whether you should invest or not of course depends on where else have you invested and if this issue fits in with your other goals or not. One thing I have always said in the past and want to repeat here is that it is not possible for most retail investors or even auditors to sniff out trouble in a company till it’s very late, and in absence of that, the best bet is to spread your money around and be safe in case something goes wrong. I have not credited the amount after maturity. I. E september2018. Where to contact? What is e mail address. Next Next post: How do I know that I’m invested in the wrong mutual fund?